On a beautiful Sunday afternoon at Gilmartin Park Swinford were hoping to break their run of defeats to Kiltimagh. The last meeting in the Intermediate Championship last May saw an easy win by 14 points for the home team. Swinford started very well and a great run by Liam Moran led to an early goal chance for James Devaney which was well saves. From the following Kevin McDonagh put a free over the bar. Two wides apiece followed before a second Kevin McDonagh free extended Swinford’s lead. Kiltimagh extended their lead after the restart before a lovely Liam Moran point from a well caught kick out by Johnny Burke. Unfortunately the game was soon over as a contest as Kiltimagh hit the back of the net to put 7 between the teams. Swinford could well have been back in the match but for a great save by the Kiltimagh goalkeeper from Jason McLoughlin. Kiltimagh got another point that looked well wide but was given by the match officials. Both teams emptied their benchs and rattled off a few points each with the Swinford scores coming from James Devaney, Liam Moran (F), Mark McNicholas and a monster point from Mark Forkan. The game finished Kiltimagh 1-13 Swinford 0-7. 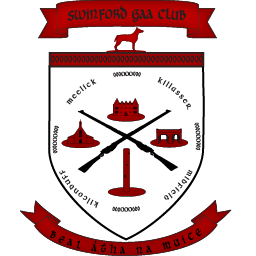 There is a lot of work to be done by the Swinford team but they have certainly narrowed the gap since last May. Swinford: Sean Kavanagh, Aiden McLoughlin, Paul McDonagh, James Lavin, Mark McNicholas, Sean Brady, Kevin Barry, Michael Walsh, Mark Forkan, Joshua Smith, Johnny Burke, Liam Moran, Kevin McDonagh, James Devaney, Jason McLoughlin Subs: Darren Campbell, Alan McLoughlin, Louis Cummins, Caoimghin McLoughlin, Antony Friel.